Last week I sat behind one of these in traffic and then followed it up the road. The guy driving it looked like he was in his 30's and really enjoying cruising with the top down on a beautiful day. 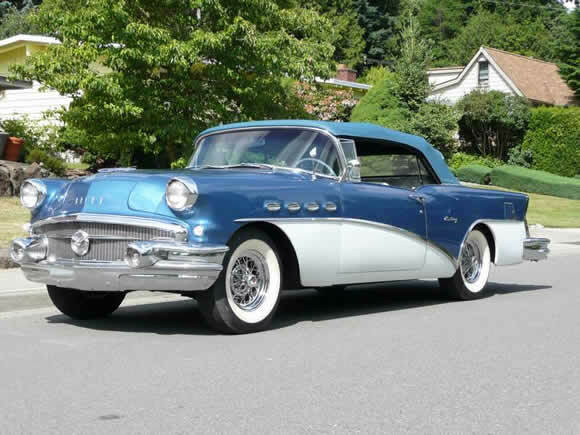 Old Buicks are very cool and the '56 Century is no exception. In 1954 Buick brought out the second generation Century and had a winner on their hands. They progressively put up the horsepower of the 355 V8, the '56 had 255hp, until the 57, 58 were developing 300hp from 364 cu inch V8's. They were considered 'lightweight' at the time so performance was very good. All I know though is that rolling in one of these with the top down on a sunny would be beautiful motoring.